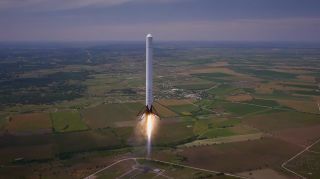 SpaceX's Falcon 9R reusable rocket prototype soars to an altitude of 3,300 feet (1,000 meters) during its second flight test, which occurred over McGregor, Texas. Imagery released May 2, 2014. The future of United States space travel will involve significant governmental cooperation with private industry, according to a panel of spaceflight experts. Government contracts with aerospace firms have changed the face of spaceflight in the United States. NASA officials hope to start using privately built spaceships to ferry astronauts to and from the International Space Station by 2017, and two companies (SpaceX and Orbital Sciences Corp.) already fly robotic vessels full of supplies to the orbiting outpost. SpaceX engineers have been working for years to develop a fully and rapidly reusable rocket stage. The spaceflight firm recently soft-landed the first stage of its Falcon 9 rocket in the ocean after launching it to space. But Antonio Elias, the executive vice president and chief technical officer at Orbital Sciences, thinks that developing reusable rockets might not be the best use of resources without plenty of launches to support it. "If the absolute elasticity of demand for launch and price is sufficiently high and if SpaceX is able to go to 50 or 60 flights a year, their efforts in reusability will pay off handsomely," Elias said during the Brookings Institute panel discussion. "But if it falls short of 50 to 60 a year, it's going to be wasted money." 3D printing also holds a lot of potential for future spaceflight ventures, according to Adam Harris, vice president of government sales at SpaceX. Recently, SpaceX tested a 3D-printed metal rocket nozzle at the firm's test stand in Texas. "3D printing is a major advancement that SpaceX is trying to use to lower the cost of building, lower the cost of research and development," Harris said. "This is an advanced way of doing 3D printing. It's with metal and it's with better metals. A lot of the 3D printing technology relies on plastics and other ways of doing it." On the scientific side of the coin, Mars should be an exploration goal for scientists in the future, said Michael Meyer, lead scientist for NASA's Mars exploration program. NASA's Mars rover Curiosity has confirmed that the Red Planet could have been habitable in the distant past, and further study is needed to understand whether life did exist on Mars. "One of the things that we'll look at in the future is not only deciding whether or not life ever got started there, but in all honesty, I think it's the only place in our solar system that has any real possibility of colonization," Meyer said during a second Brookings panel today (May 14). "So, in the long term, I think going to Mars will be a theme whether or not we're doing it robotically or whether or not we're doing it with humans." Other bodies in the solar system are also worth investigating, experts said. "As far as I'm concerned, 2015 is the year of the dwarf planets because we have two missions out there," said Nadine Barlow, a professor of physics and astronomy at Northern Arizona University. "One [NASA's Dawn mission] is on its way to Ceres, which is the largest asteroid in the asteroid belt, but is also known as a dwarf planet." The second big mission is NASA's New Horizons mission scheduled to arrive in the Pluto system next year, she added. Jupiter's icy moon Europa has a liquid water ocean underneath its ice shell that might be able to host life. NASA is currently looking into a Europa mission that could help scientists understand whether the moon could harbor life. "Depending upon what we find on Mars, what we find on Europa, what we find on [Saturn's moon] Enceladus, it may give us very good clues about what was going on in the early solar system and where the places are that life could have begun," Meyer said.